Well Therese and I are now in South East Asia and have completed our climb of Mt. Kinabalu. We don’t have much time with the computer but I wanted to upload a few photos of the climb so you could see what we experienced. It was an incredibly challenging but rewarding experience. I can’t wait to write a proper entry about our two-day trek up Mt. Kinabalu in Sabah on the Malaysian part of Borneo. After seven days in Beijing I was ready for a change. So I sent an email to my good friend Simon and started looking into high speed train tickets to Shanghai. Simon’s Dad, Jean-Paul, lives in Shanghai with his wife Limin and two lovely kids Alex (5) and Molly (8). After a few emails and some phone calls between Simon (who was in London, ON) and his Dad we managed to sort out a plan and I booked a ticket to Shanghai to stay with the family for two nights. 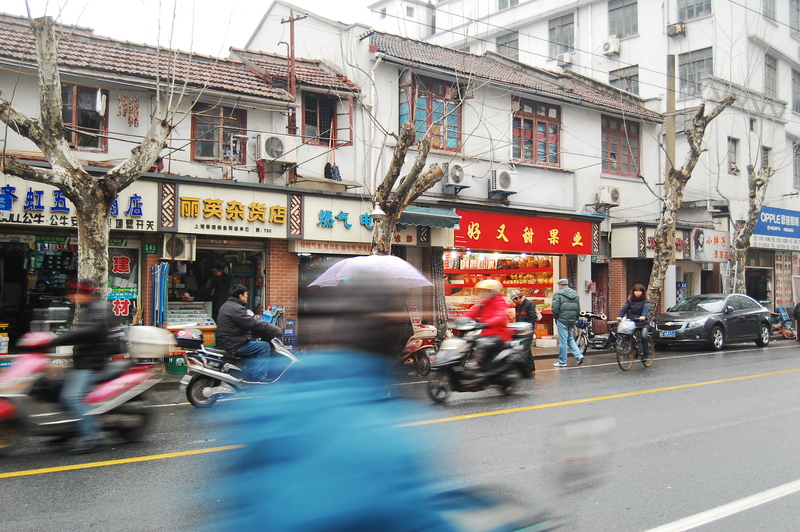 The busy streets of old Shanghai near the Bund. The train ride was a welcome change of pace. I spent most of the ride writing postcards and reading Chronicles by Bob Dylan, listening to music and dozing in between chapters. The high speed train turns a 12-13 hour trip into a 5.5 hour haul, speeding South through the Chinese countryside and rice patties. I arrived in Shanghai and took the subway to meet Limin and settle in at their beautiful home only 15 minutes from the city’s core. After getting to know the kids and playing a few games Jean-Paul arrived home from work and we had a delicious meal of authentic, home-cooked Chinese food. Braised short ribs, tofu, beans, rice, chicken – you name it. Following dinner Jean-Paul gracious got in the car and drove me downtown to walk along the Bund at night and see the bright lights of the young city. The downtown of the city is mostly composed of towering sky-scrapers, most toppeed with unique designs reflecting the traditional of ancient Fengshui. It is an interesting juxtoposition between the old and the new as the buildings all take on a decidely modern form. 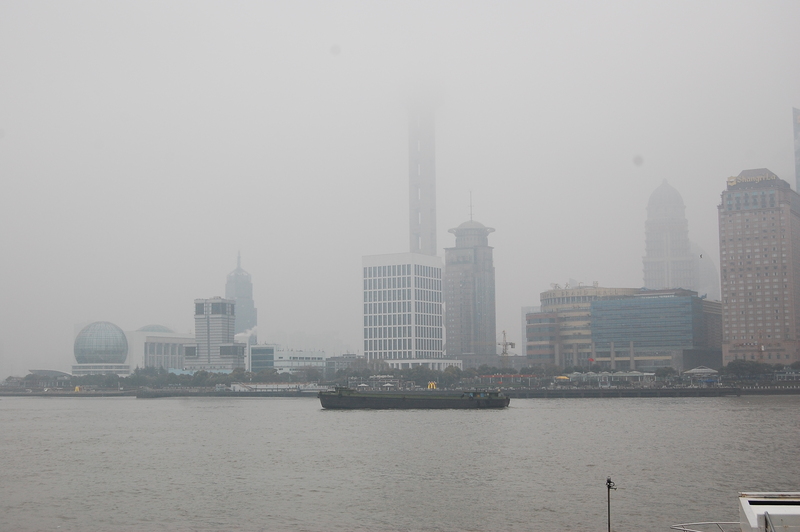 A misty view of the financial district from the Bund. We strolled along the river in the evening’s mist (a nice change from the biting cold and desert like climate of Beijing) and ended up at the foot of one of the tallest towers. Jean-Paul ushered me into the building and we rode the elevator to the 56th floor where there is a hotel. The view was amazing and I was really able to take in the city despite the fog. He told me he had a surprised and we strolled into the hotel’s bar (I was terribly under dressed in jeans and converse) where a jazz band was playing and the ceiling was 40 stories high. The setting oozed luxury – something Shanghai is known for. The next day Limin was kind enough to take me under her wing and take me around the city visiting a temple, Yu Yuan Gardens, the Bund, old Shanghai’s narrow streets and even riding the ferry. 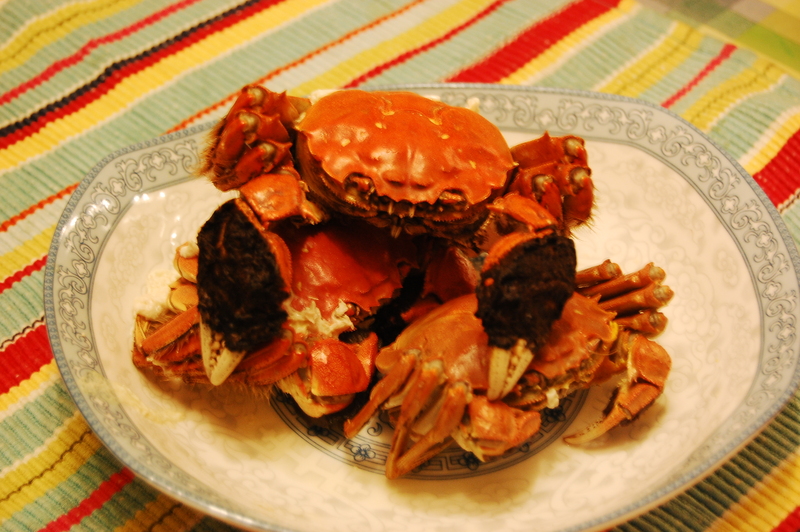 I think we were both pretty wiped out by the days end when we sat down to a dinner at home of Shanghai’s hairy crab. Dinner! I ate that big one on top, I swear. Yes, that’s right, hairy crab. For those of you who know me well you know I am not partial to seafood but I followed Limin and Jean-Paul as they showed me how to crack the shell and dig out the buttery, sweet meat. I’ll admit, it was quite good and I wouldn’t object to eating the delicacy again. The kindness of Jean-Paul, Limin, Molly and Alex was overwhelming. It was so nice to spend a few days with a family, hearing the kids practice piano and reading bed time stories when I was miles away from home. Thank you to Simon for arranging the visit and to Jean-Paul, Limin, Molly and Alex for welcoming me into the family. I will never forget the whirlwind 3 days I spent in Shanghai. 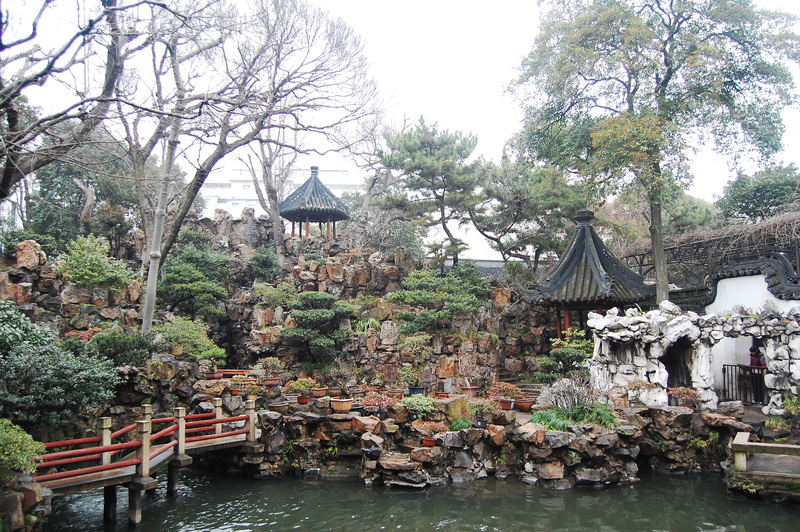 Yu Yuan gardens - a sanctuary in the heart of Shanghai. Now Therese and I are packed and heading off to Malaysia tonight. Blog posts might be harder to complete as we won’t have a computer of our own but I’ll try to keep updating as often as possible. 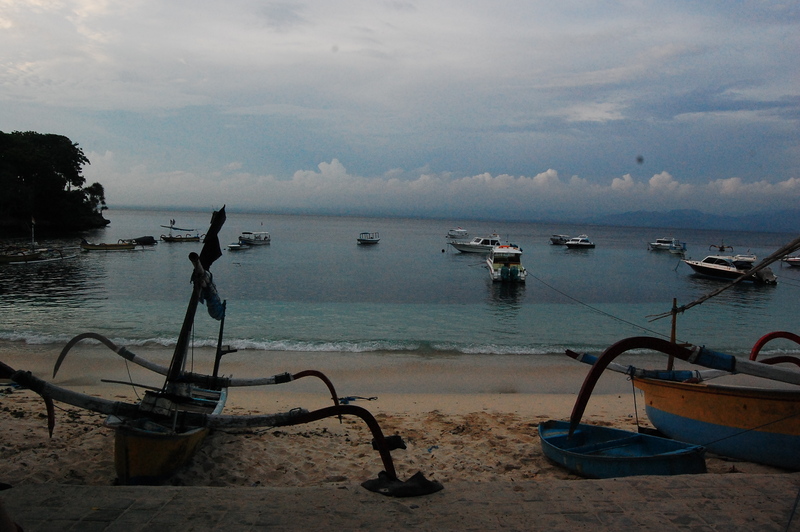 For this post I am going to let the photographs do most of the talking. Through the hostel I was staying at, I booked a ride for Ian and I to see the Great Wall of China. Based on the advice of many who had gone before, I chose a section of the wall further out from the city, one of the unrestored portions of the wall that would be less busy with tourists and people selling souvenirs. After some discussion we settled on the Jinshanling to Simatai portion of the Great Wall, a three hour drive from the city. We left at 8:30, spent 4 hours on the wall hiking 7km through 22 guard towers. 2.) Its architecture includes some of the obstacles the Chinese designed in the wall to throw off Mongolian attacks including trick entrances to some of the 22 guard towers. 3.) 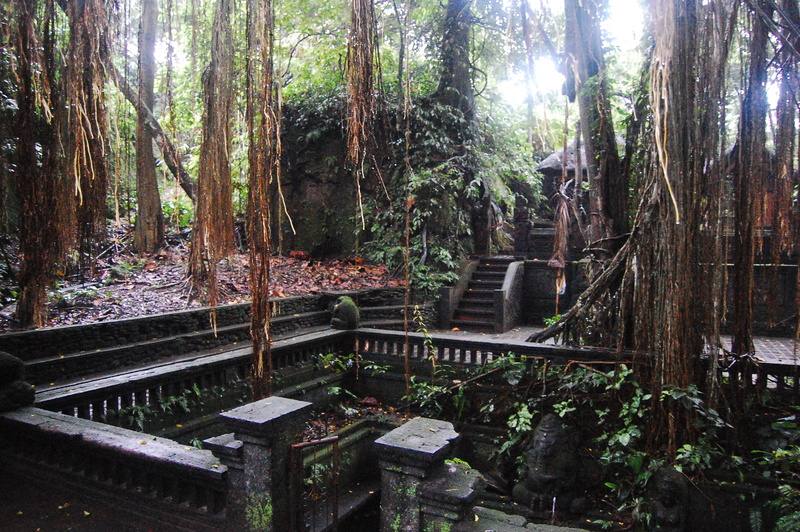 It was hit during WWII by the Japanese and the rubble remains for you to walk through. Hiking the Great Wall was truly the most incredible thing I have experienced. I felt lucky to have Ian with me as I felt compelled to keep turning around to say “Oh my goodness – can you hardly believe this?” This is a tourist attraction that lives up to the hype and is quite breath taking. The overwhelming scale of the project, (the wall stretches 10 000 km, winding across the country and took 200 years to build – talk about commitment!) the history and the beautiful surroundings contribute to the awe the wall evokes. This was the highlight of my time in China. Enjoy the photos. One of the most interesting days I spent in Beijing was one that I dedicated to the city’s many temples. Yonghe Temple, or Lama Temple as it is more affectionately referred to in Beijing, was built during the Qing dynasty as an imperial palace. In the 18th century is converted into a lamasery, a monastery for Tibetan monks, and remains active today. Stall after stall of incense for sale on my way to Lama Temple. 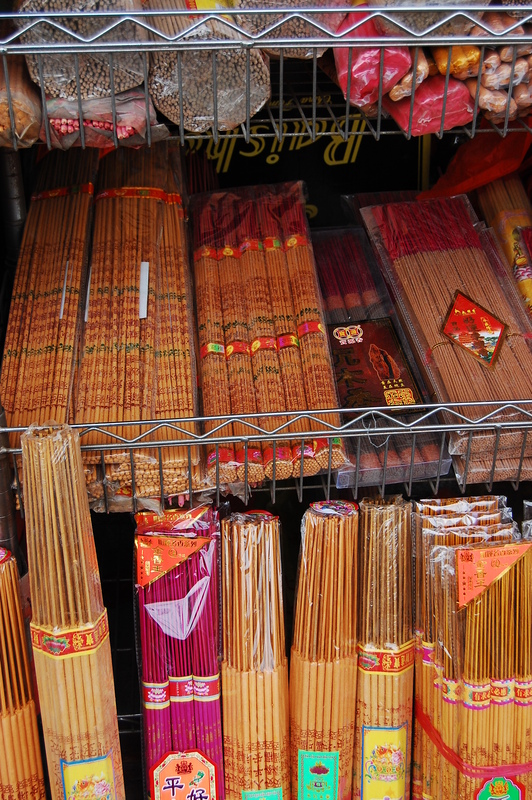 When I got off the subway to walk over to the temple I came face to face with all kinds of vendors hocking bundles of incense. I was surprised to see most of the people walking through the underground were stopping to purchase their wares, a rare site to see locals purchasing goods in the subway tunnels. It all made sense however as I walked through the gates into Lama Temple. Hundred of people were engaging in their ritual bows, handfuls of incense burning as they knelt before the numerous shrines to Buddha. 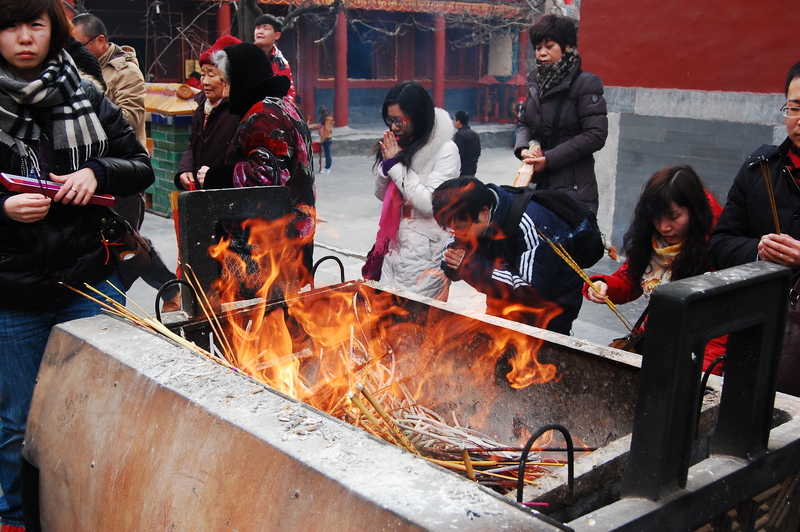 Incense burns as people complete their bows of worship. The air was thick with the perfumed smoke as I wandered through building after building on the temple grounds, eventually arriving at the dormitories for the young men training to become monks. Just beyond the dormitories stood a final building in the temple’s complex which I entered expectantly. You see, Lama Temple is known for housing a gigantic statue of Buddha. I instantly came face to face (or rather feet to face) with the statue. Standing at 26 meters tall, the statue is of the Maitreya Buddha and is carved out of sandlewood and painted gold. Unfortunately photographs were not permitted inside the buildings, but if you’re ever in Beijing this is certainly a sight worth seeing. Although tourists were milling around the massive grounds of Lama Temple, devotees far out numbered us, which made the spirituality of the space more engaging. 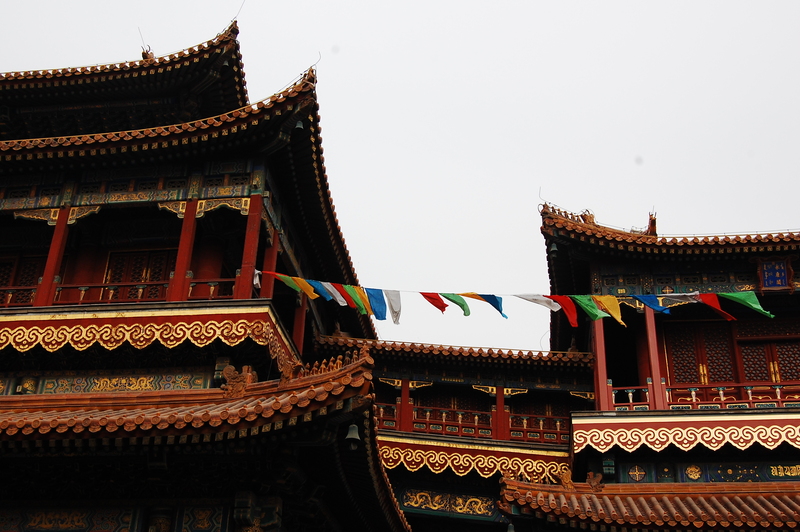 It was my first visit to a temple in China where I felt like I was experiencing Tibetan Buddhism first hand. That same day I went to the Confucius Temple down the street where most of the ancient Chinese emperors paid their respects to Confuscius and studied his teachings. This temple was equally beautiful in terms of architecture to Lama Temple however there were far fewer people, and it seemed more of tourist attraction. My final stop on my temple day in Beijing was the Temple of Heaven Park. I took a cab to the North Gate of the park and felt instantly at home wandering through the wooded acreage. 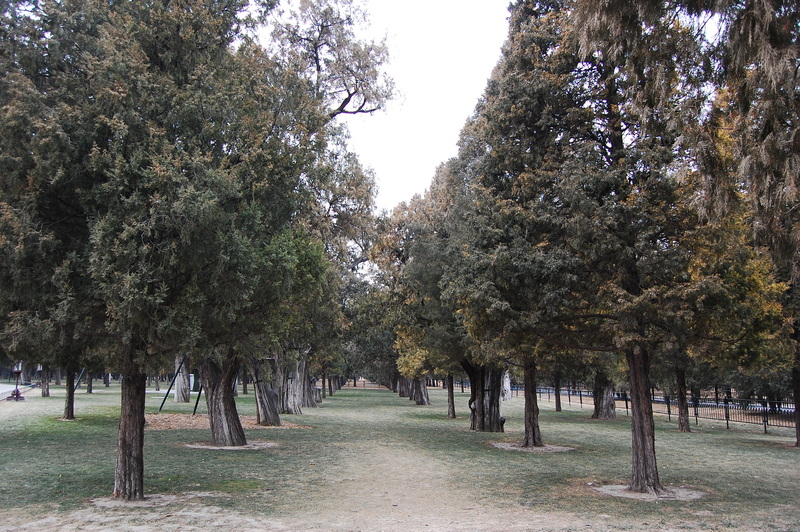 It reminded me a little bit of High Park in Toronto except instead of maple and pine trees lining the paths Cyprus and juniper trees created the landscape. This was one of the first moments during my trip where I just stood still taking in the experience. I was beaming as I stood there, alone in the heart of Beijing realizing what an incredible opportunity this was. That smile grew as I neared the center of the park, arriving at the famous temple. It rises as if out of nowhere, perched on a hill surrounded by trees. The main building of the temple is a circular, built on tiers of carved stone, each ring representing a different part of the spirit. 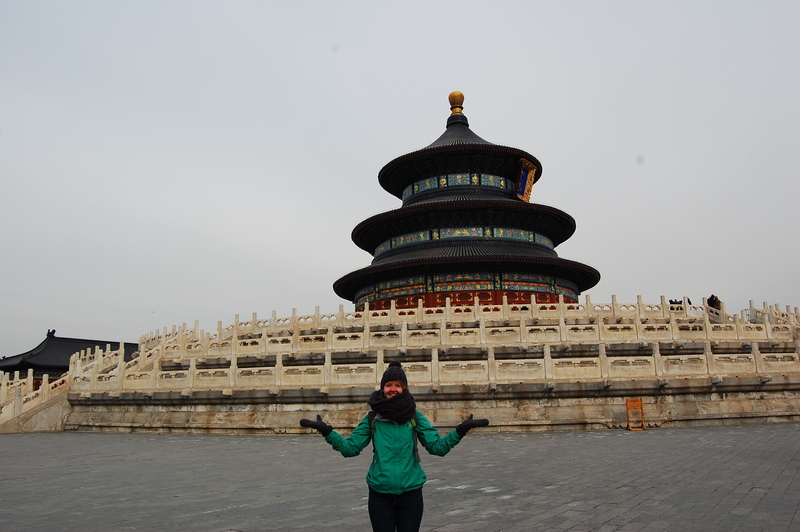 Standing in front of the Temple of Heaven. As well as this main building the temple is home to the echo wall, located in the Imperial Vault of Heaven. Like the main building the echo wall forms a perfect circle and if you arrive early enough (and with a friend) you can stand hundreds of meters apart and whisper into the wall, the sound echoing around reaching your friend’s ears. The final attraction in the park is the Circular Mound Alter and the Heavenly Center Stone. The stone is surrounding by nine tiles of stone in a circle, moving outwards in circles, each ring composed of a multiple of nine tiles, the outside ring consisting of 81 tiles, paying homage to the nine heavens. A busy day, my visit to some of China’s most famous temples was quite rewarding. I felt I had the chance to really relish the experiences I was having and find a greater understanding of both the history and the cultural significance of Buddhism. I chose quite possibly the best day to arrive in Beijing for my Chinese adventure. It was the last night of the New Year celebrations and fireworks were exploding in the streets – a little overwhelming at first, but quite festive once I got used to it. I managed to find my way to the hostel (The Peking Yard, it came highly recommended from Ms. Jennifer Savory) hidden away down a side street or Hutong in Beijing’s first ring. The city is composed of five rings, the first is the city’s core and downtown moving outwards to financial, business and residential districts. The hostel was quite close to the subway which made daily outings easy, and the best dumplings and soups were only minutes away. 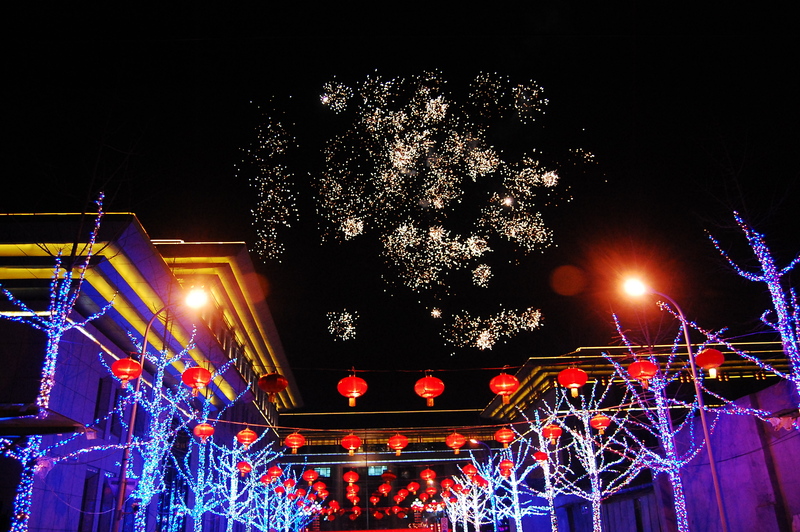 Fireworks exploding in Beijing's streets on the last day of Chinese New Year. The first night I ventured into the noisy streets to meet up with my friend Ian who is working as a producer in Beijing for an English-Chinese network called BON. He took me to one of the original hutong areas in Beijing close to the Drum and Bell tower where I had my first encounter with proper Chinese food. Following dinner we walked down the narrow streets, getting hit on occasion by a firecracker (ouch!) as our eyes cast upwards toward the colourful night sky. This is how my week in Beijing began, and the excitement didn’t wear off. I woke up excited and a little nervous to navigate the city by myself the next day. 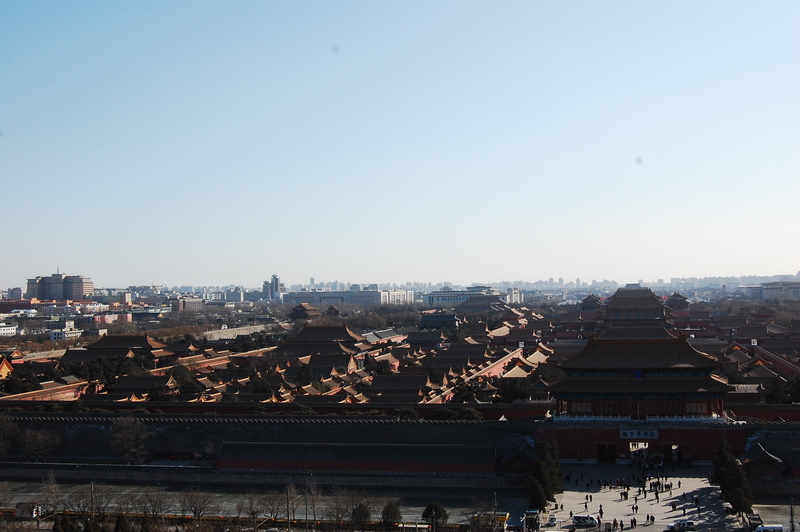 My plan was to visit Tiananmen Square and the Forbidden City. I boarded the subway system (thanks to a “helpful” push from the many security guards working on the platforms) and after only one transfer emerged at the famous square. 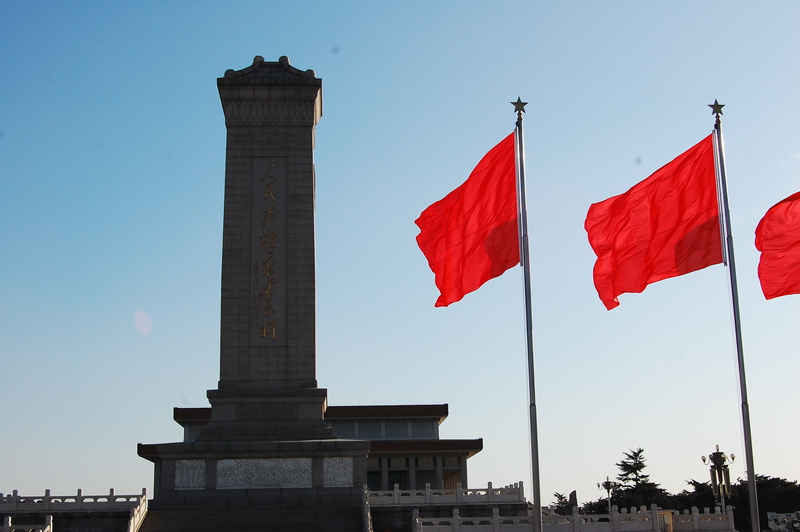 Tiananmen Square is home to some of Beijing’s main attractions, the legislative buildings, the National Center for the Performing Arts, Mao’s Mausoleum and the Forbidden City are all located within walking distance. The square itself is a large open space with various memorials erected as a salute to communism. Red flags fly and security is tight with surveillance cameras and police officers keeping watch. 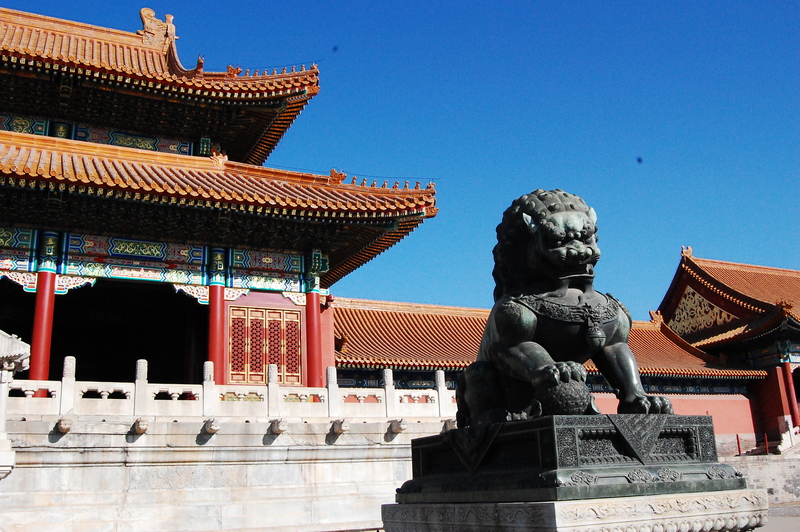 One of the most overwhelming sites in Beijing is the Forbidden City. Now refered to as “the palace museum” The Forbidden city was the Imperial Palace from the Ming to the Qing dynansty and have over 900 buildings within it. The entire city is surrounded by a wall, guard towers and a moat and we off-limits to the public for 500 plus years. This was my first taste of Chinese history and traditional architecture up close and it was incredible. The pagoda-style entrances, the intricate stone work and the elaborate halls cover 7.8 million square feet and it took me five hours to feel I had even a small understanding of the area’s significance. It was terribly cold so I mixed the courtyard sites with the exhibits in doors, particularly enjoying the display of clocks gifted to the emperors by various European diplomats and royals during their reign. The clocks were over the top, decorated with animals, flowers and people, each inlaid with precious metals and jewels. Another highlight was the nine dragon screen in the Forbidden City. 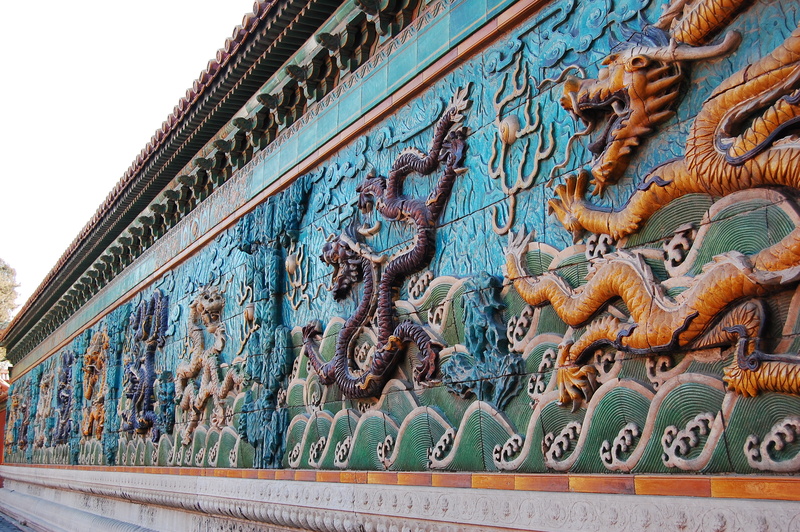 While researching the sites in Beijing I grew somewhat fascinated by the dragon screens which illustrate the creature’s many powers. The Forbidden City nine dragon screen. You see, it’s the year of the dragon and I happen to be a dragon child so I feel a kinship with all things mythical and scaled. I managed to see both of the famous nine dragon screens while I was in Beijing, the other located near by in Behai Park. Following my visit to the Forbidden City I crossed the street and headed into Jinshang Park. The park is best known for its view of the Forbidden City. After a short but steep climb I reached the top where there is a Buddhist shrine and a look out, where I took in the vastness of the ancient city from above. I rounded out my first full day in Beijing with a visit to Silk Street and dinner with Ian, leaving me pretty wiped out and eager to flop into my cozy bed at the Peking Yard. The rest of the week I organized using my trusty Lonely Planet and the advice of the many Chinese students staying in the hostel. I would dedicate a day to the city’s famous temples, one to its art’s district, one to music, one to the hutong alleys and further exploring in Tiananmen Square, one to the Great Wall and one to shopping for souveniers at the various markets. Now 21 postcards and 473 photos later, I am back in South Korea and will try my best to summarize the experience in a few blog posts. Hope you enjoy! After a very lazy Sunday afternoon following our temple stay at Golgulsa, Therese and I were up in good time Monday morning to catch a bus to Busan. We had just received confirmation that we would be climing Mt. Kinabalu in Borneo, Malaysia at the end of February so we wanted to start doing more hiking in preparation. In Busan there are many hiking trails so it was the perfect opportunity to start training for the climb and see another part of South Korea. Busan is located in Gyeongsangnam-Do province, just South of Pohang. A coastal city, it is known as one of the more metropolitan cities in South Korea with mountains dividing the city into sections along the South Sea coast. I was eager to visit as my dear friend Jen had just spent a year living and teaching in Busan and I wanted to get a taste of her life during that period. Arriving in Busan, Therese and I followed street signs to a path leading up to Beomeosa Temple. The temple is one of the northern starting points for trails across Geumjeongsan, the mountain range Therese and I were going to hike along. It was about a five kilometer walk up hill to the temple where we took in some of the traditional architecture before figuring out which path to take to get to the North Gate, part of the Geumjeong Fortress built on the mountain. We would then hike from the North Gate to the South Gate, a 10 kilometer trail following the fortress wall passing the East Gate and various restored watch towers along the way. We spent five hours on the trail, winding through the mountains stopping to take in the beautiful view of the ocean and Busan along the way. A highlight was standing on the wall at Wonhyabong Peak, the highest part of the mountain range with a 700 meter elevation. This put our climb of Mt. Kinabalu in perspective as that mountain’s elevation is over 4000 meters. By the time we arrived at the South Gate the sun was setting over the park and we opted to take the cable car down. With the sun low in the sky and our body temperature’s dropping we both were shivering as we rode down the mountain, grabbing a cup of tea before boarding a bus back to Pohang. We took countless photos of the beautiful scenery along the way so I’ve included a small slideshow of images. It is now Sunday, February 5 and I leave for Beijing tomorrow morning. I am excited but also nervous to start the solo portion of my Asian adventure.